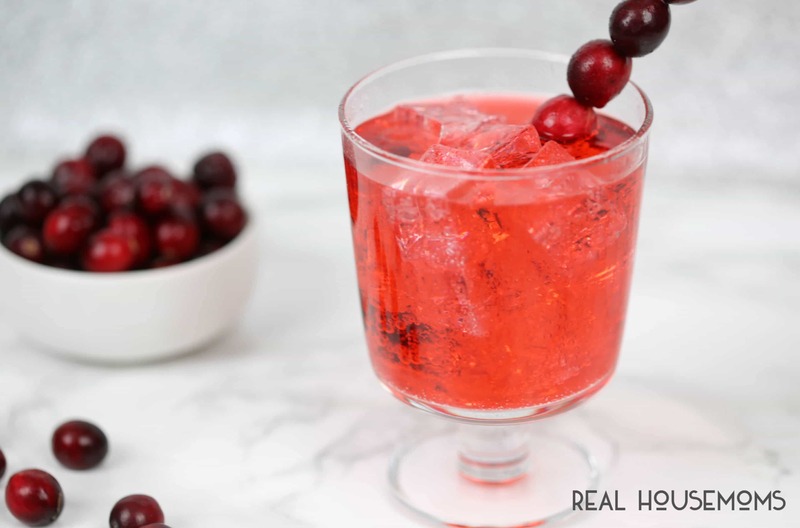 This Cranberry Ginger Fizz Cocktail is a bright combination of the cranberry flavor I love with a hint of ginger for a holiday cocktail you can’t beat! One of my favorite parts about the holiday season is the abundance of cranberries. I just love those tart little gems. Whether they’re fresh in homemade cranberry sauce (check out my mother-in-law’s recipe here) or dried and mixed into salads or granola, I love how cranberries add big flavor to recipes. They’re also great for decorating too. I usually fill one of my large hurricane jars with fresh cranberries and nestle a candle down in the center. Then I wrap fresh pine around the base. I love the rustic look during the holiday season. Another great way to use cranberries is in cocktails. 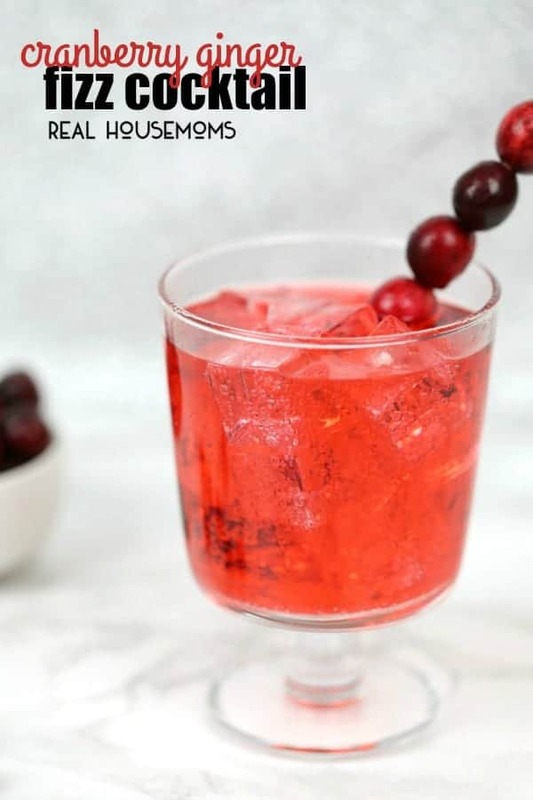 A while back, I made an amazing Cranberry Moonshine. It’s a potent homemade cocktail that is perfect for the holidays. It’s sweet and strong and perfect for sipping next to the fire. And, it’s great for gift giving. Last year I gave out jars of it to my friends and family. This cocktail recipe is really quite simple to make. There are no fancy techniques or hard-to-find ingredients. I used my Cranberry Moonshine as the base of this cocktail but you could easily substitute cranberry flavored vodka. The color of this cocktail is a gorgeous bright reddish-pink and with the effervescent bubbles, it really looks festive. This cocktail is perfect for holiday parties, too. I served it to my friends last year and everyone was asking for the recipe. You can easily make the fresh cranberry garnish by skewering fresh cranberries on a wooden skewer cut to size. It adds a festive touch to the cocktail. 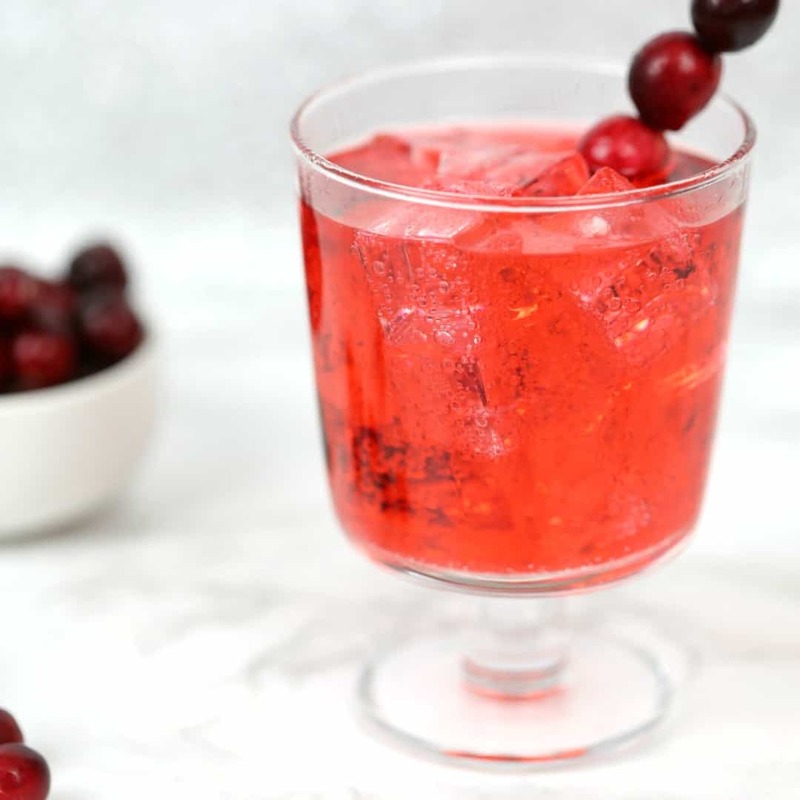 This Cranberry Ginger Fizz Cocktail is a bright combination of the cranberry flavor I love with a hint of ginger for a holiday cocktail you can't beat! Add 2 shots of cranberry moonshine to glass. Pour in ginger ale to fill the glass. Thread fresh cranberries onto a wooden skewer and garnish cocktail.